Unfortunately, I clicked on the link to see if this is truly what the Fed believes. If you’re not in the mood to read an entire blog post, let alone a Fed working paper, the nickel summary is: No, I don’t think this is what the Fed said at all. But there are certainly nuances here. So let’s spend some time comparing Millennials to Gen X. The full Fed report is here, and this is what it found. Note that all of these things compare Millennials and Gen X at points in time where they were similar ages (roughly around 1995 for Gen X and 2015 for Millennials). Millennials don’t hate cars. In fact, they buy them at exactly the same rate as Gen X. 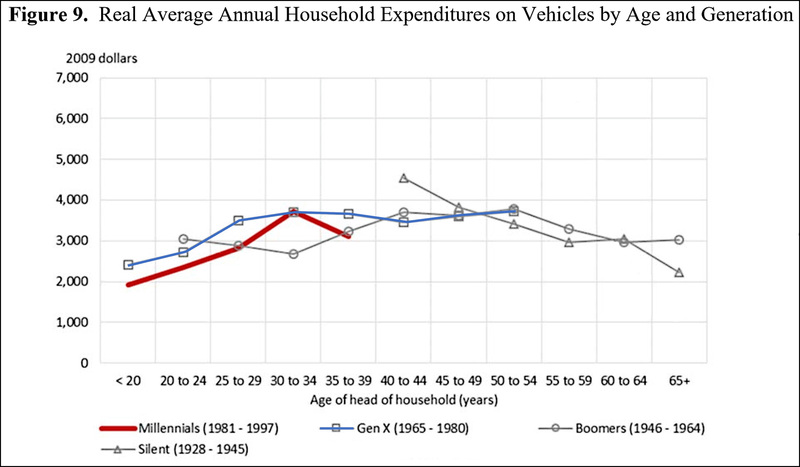 In both generations, about 82 percent own cars and the average value of their cars is $17,000. Millennials are slightly better educated than Gen X. They get married at lower rates than Gen X.
Millennials have slightly higher incomes than Gen X. They spend money at about the same rate as Gen X. And their spending habits are fairly similar, with a few interesting deviations. Millennials have slightly less total debt than Gen X: $19,600 vs. $23,100. Their homeownership rate is far lower than Gen X: 34 percent vs. 50 percent. However, among those who own homes, Millennials own more expensive homes: $165,000 vs. $135,000. Those homes also come with higher mortgages: $105,000 for Millennials vs. $94,000 for Gen X. Net worth is about the same between generations: $48,000 for Gen X vs. $42,000 for Millennials. By far the biggest difference between Millennials and Gen X is in homeownership: 34 percent vs. 50 percent. This also affects the nature of their debt: among those who do own homes, Millennials have bigger mortgages: $105,000 vs. $94,000. Millennials, on average, also have higher education debt: $18,000 vs. $13,000. On all other measures—income, spending, debt, net worth—Millennials at age 30 are pretty similar to Gen X at age 30. They aren’t post-consumerist, they don’t hate cars, and they aren’t especially poor. 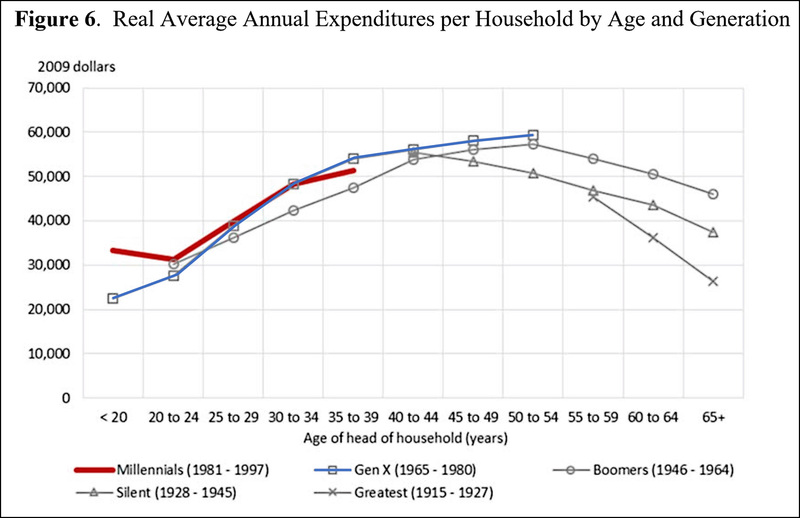 Compared to Gen X they spend a little more on food and a little less on entertainment and clothes. They spend more on housing, but less on transportation. And that’s about it. Almost literally, the only big difference is in homeownership, and even there it’s hard to know how much of this is because of changing tastes and how much is because housing costs have gone up. I suppose that would require another study. POSTSCRIPT: Some of you may be surprised by the housing numbers. Isn’t a $105,000 mortgage awfully low? No. It’s not. This is something I gripe about periodically, but when you say Millennial everyone immediately thinks of a bright, young college-educated person who lives in New York City and voted for Bernie Sanders. But that’s only a fraction of the Millennial population. Most of them don’t have college degrees and live in ordinary cities or rural areas where houses don’t cost a million dollars. If you live in Toledo, you can buy an ordinary 2-bedroom house for $150,000 or less. Ditto for Des Moines, Abilene, and Scranton. I suspect that a lot of people really need to readjust their mental picture of what an average Millennial is like.